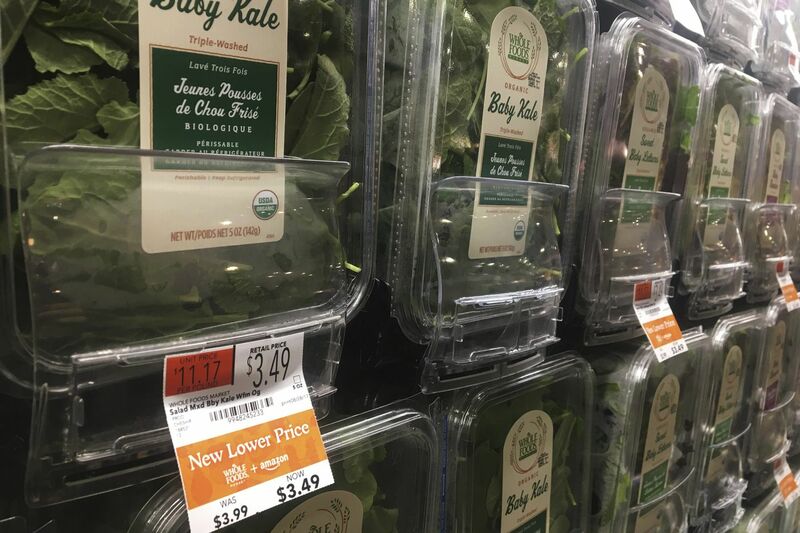 Organic baby kale that has been reduced in price appears on sale at a Whole Foods Market in New York, Monday, Aug. 28, 2017. Amazon has completed its $13.7 billion takeover of organic grocer Whole Foods, and the e-commerce giant is wasting no time putting its stamp on the company. Prices were lowered; Whole Foods brands will soon be on Amazon's site; and Amazon's Prime members could soon get discounts at Whole Foods. The deal could also spur changes in the wider grocery industry. Amazon's blockbuster deal to buy Whole Foods Market for $13.7 billion last August was met with much fanfare about lower prices. The internet giant, which has dominated the retail industry by undercutting its rivals, immediately slashed prices of some items after acquiring the notoriously expensive grocery chain. The cost of organic Fuji apples, for example, fell 43 percent on the first day of Amazon's ownership. Amazon-Whole Foods: A year later, what’s changed? The quick cuts prompted some observers to assert that Whole Foods had officially shed its pricey reputation. "The days of 'Whole Paycheck' are over," declared the Washington Post, the newspaper that has the same owner as the grocery, billionaire Jeff Bezos. One year later, though, shopping at Whole Foods will still cost you much of your paycheck — unless you're an Amazon Prime member. Whole Foods prices have fallen modestly overall, and the grocery is still more expensive than much of its competition, research shows. >> READ MORE: Amazon-Whole Foods: A year later, what's changed? Whole Foods prices fell 2 percent year-over-year in July, according to Morgan Stanley. A basket of 60 items including fresh and processed goods cost $195, roughly 13 percent more – or $22.49 – than at a typical conventional grocery store. Driving that premium were the grocery's protein products — eggs, chicken and beef — which were 28 percent costlier than the competition's, Morgan Stanley's analysts found. "When Amazon bought Whole Foods, everyone thought … 'Now I'm going to be able to buy quality stuff at Whole Foods at Amazon prices,'" said Kevin Brasler, executive editor of Consumers' Checkbook, which recently conducted its own grocery price study in the Philadelphia area. "They've lowered prices based on our most recent research, but not a lot." A Whole Foods spokesperson did not respond to requests for comment. The chain, with 467 U.S. stores including nine in Southeastern Pennsylvania and three in South Jersey, recently rolled out new perks for Prime members that will give Amazon's loyal customers special discounts. Consumers who pay $119 per year for Prime can save 10 percent off sale items and some other products at Whole Foods. "We believe that the inclusion of Whole Foods in Prime Day was a watershed event, driving Prime members to shop at Whole Foods with prices that were even below some supermarkets, and driving Whole Foods shoppers back to Amazon to participate in Prime Day," Wolfe Research analyst Scott Mushkin wrote in July. That survey also found that Whole Foods hasn't shaken its "Whole Paycheck" moniker since the Amazon takeover. About 70 percent of people who don't shop at Whole Foods say it's too expensive. Brasler, the Consumers' Checkbook editor, said Whole Foods is still the most expensive supermarket chain in greater Philadelphia. The nonprofit publication plans to release all of its findings on regional grocery prices after Labor Day. But Whole Foods still has a long way to go before competing against the likes of Wegmans, which Brasler said gives consumers "the best of both worlds" – low prices and high-quality food. "When you start off 40 to 45 percent more expensive than Wegmans, to lower your prices even by a double-digit number doesn't do much for you if you're a shopper," Brasler said of Whole Foods' recent price cuts. "With supermarkets, people have made up their minds," Brasler said.